Here is the view from the garden door on the main floor. 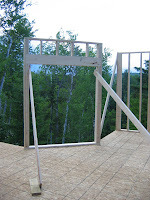 Put your imagination cap on and you can see [well I can... ;-) ] the deck for the gazebo, and just over the hand railing I can see the top of our bunkie, or guest cottage. The rough opening for the gazebo is shown below. 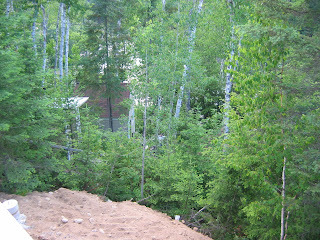 The Bunkie is were the project manager and the project cook ( his wife) call home at the end of a construction day. Just in front of it (to the the left of the picture you can just see the front of the outhouse.